The most impressive woodlands in the park are along Prairie Creek and several tributary streams, sheltered in an 800-foot-deep valley. Even the tributary creeks such as Godwood Creek and Brown Creek become increasingly scenic as they approach within a half-mile of Prairie Creek. Magnificent redwoods are everywhere and every inch of the forest seems to drip with greenery. Fallen trees have turned into dense gardens with ferns and trees fighting for space on the decaying logs. The rich, primieval look of this forest, especially when seen in the dim light of late afternoon, is like no other. Prairie Creek lacks a “main attraction” alluvial-flat loop hike to serve as a focal point and bring in visitors. 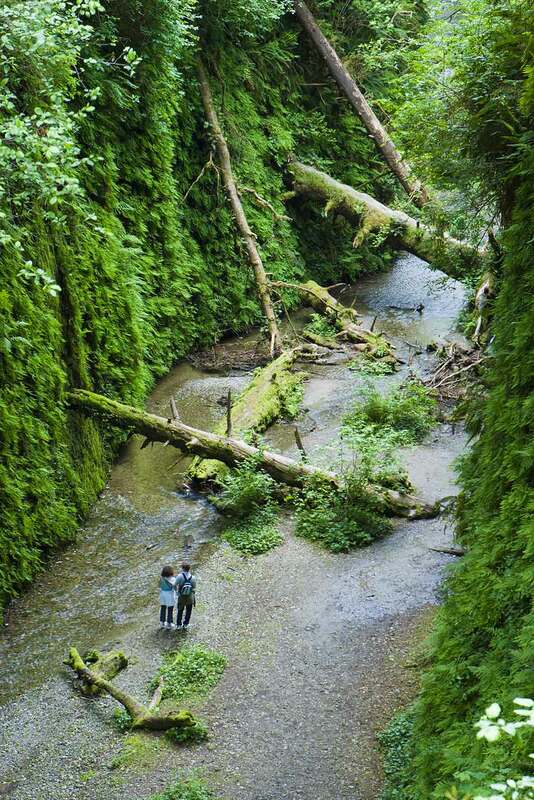 The most popular attraction is Fern Canyon, which is the only part of the park that can get busy. Even on summer weekends the rest of the park is never particularly busy, and in the winter you can spend an entire weekend on the trail without seeing even one other hiker. Most of the longer trails (West Ridge, Prairie Creek, Foothill, and Rhododendron) run either along a ridge or along Prairie Creek for their entire length. If you hike the entire trail at once, the environment changes very little and after a few hours it can get kind of monotonous. So instead of taking one long hike, it’s a lot more enjoyable to combine short segments of ridge and valley trails into short loops, and hike several of these loops in different parts of the park. The Miners’ Ridge and James Irvine loop is a notable exception and is a great all-day hike with plenty of variety. During winter storms, even mild ones, Drury Parkway is often closed for the day. If the parkway is closed you won’t be able to reach many of the park’s trails like the Brown Creek loop and the Hope Creek loop. On the other hand, it’s a great opportunity to hike the Prairie Creek and Foothill Trails without the usual traffic noise. Perhaps the world’s best redwood hike, this loop takes you through spectacular redwood forest, over wild and scenic Gold Bluffs beach, between the sheer fern-covered walls of Fern Canyon, and finally through the lush Godwood Creek Valley. An outstanding hike that climbs to the old-growth uplands on top of West Ridge, then descends to the big trees and the maples along Prairie Creek. The Brown Creek Trail runs alongside a burbling creek in a shallow glen where the park’s densest redwood forest grows. Isolated from the traffic noise of Drury Parkway and enclosed by the valley and the tree canopy, the glen almost feels like a huge indoor garden. This little-used trail climbs through a spectacular redwood-filled canyon off of Drury Parkway. It’s very scenic but unfortunately rather short, like part of a longer trail that got cut off. This easy loop through some of the park’s best redwood forest goes from the Visitor Center to the Big Tree. You’re never very far from the traffic noise of Drury Parkway, but it’s a nice introduction to the park. The Ten Taypo Trail starts among impressive redwood lowlands and gradually climbs into less-impressive highlands. The Hope Creek Trail descends steeply back to the starting point. Starting at the visitor center, this excellent hike on the east side of of Drury Parkway runs through sunny old-growth redwood uplands for several miles, then descends to the Brown Creek Trail. The Foothill Trail is initially less interesting, but then it passes through two impressive alluvial-flat groves. This loop features the northern portion of the Rhododendron Trail, which undulates over ridges and through valleys before descending to the incomparable Brown Creek. The loop starts with a stroll through open grasslands along the base of Gold Bluffs. The route then climbs into the redwoods, meandering along a convoluted hillside where redwoods grow from an unbroken sea of ferns. The hike ends with a walk through Fern Canyon. A shorter version of the Rhododendron and Foothill hike. The Rhododendron Trail climbs through dense redwood forest, while Cal Barrel Road is a very nice dirt road that descends through outstanding redwoods. A short stroll on an erased logging road that passes through exceptionally attractive redwoods. Interpretive signs describe how and why the road was removed. Much of the original Nature Trail has been closed, leaving a short loop that climbs above Prairie Creek and that can only be hiked in summer. The first half of the trail is very impressive, the second half less so. Carruthers Cove is a secluded beach in Prairie Creek Redwoods State Park that can be reached by a short descent on the Coastal Trail. This trail starts in attractive old-growth redwoods, but it soon leaves the redwoods behind as it descends to an expansive, deserted beach. This trail runs along the edge of the redwoods around Elk Prairie. There are some big redwoods at the beginning and end of the loop, but mostly the trail runs through brush and non-redwood forest. The Little Creek Trail is a short trail that climbs through a canyon off of Drury Parkway to a memorial bench. Surprisingly, it doesn’t have a lot of redwoods. With 75 campsites, this is Prairie Creek’s main campground. 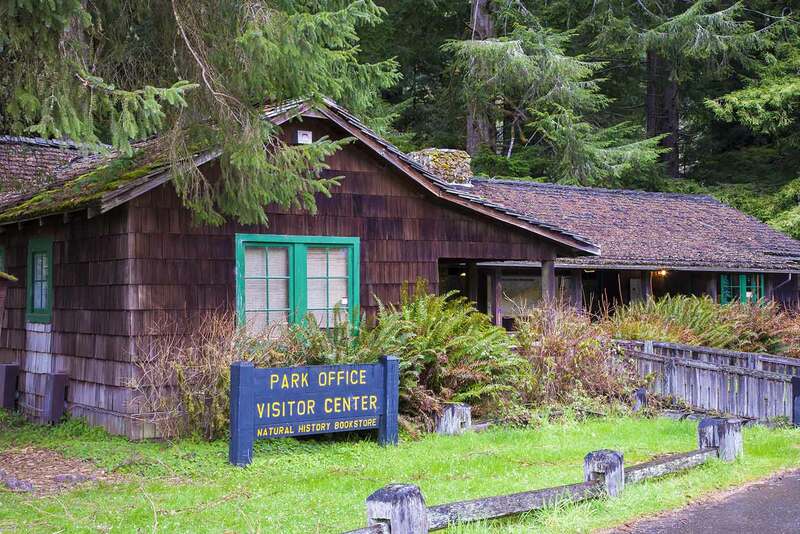 It’s very pleasant and is conviently located a few yards from Prairie Creek’s main trailhead, but none of the sites are actually in old-growth redwoods. The Beach Campground is a five-mile drive from Highway 101 on a the dirt road. The campground is in the middle of an open grassy plain next to a huge, mostly-deserted beach. Four clean but very basic cabins are also available. Flint Ridge is a backcountry camp on a sunny shrub-covered hill by the sea. It’s a five-minute walk from the parking lot so it offers more of a quiet, natural setting than the drive-up campgrounds. The park is just off Highway 101 40 miles north of Arcata. To get to park headquarters, exit onto Newton B. Drury Scenic Parkway. To get to Fern Canyon, take Davison Road from the elk viewing area and drive 8 miles to the end of the gravel road. Most parts of the park are free; however, there’s an $8 fee to use Davison Road or to park in the overflow parking area in the Elk Prairie campground. 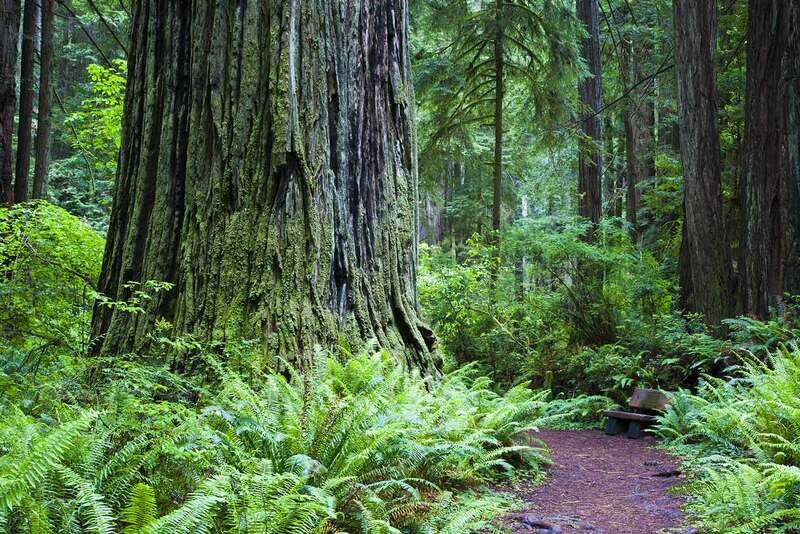 A trail map of Redwood National and State Parks, including Prairie Creek Redwoods, is available from Redwood Hikes Press. The printed trail map is almost the same as maps on this website, but without greyed-out trails. The National Weather Service forecast discussion, intended for weather professionals, is very technical but also very useful. The National Weather Service’s Digital Forecast for Prairie Creek is the most detailed forecast available. The real-time Northern California satellite photo lets you see if it’s cloudy or foggy. A very nice color version is also available, but it’s not updated as often.